Retirees gathered in the cities of Tehran and Isfahan on Sunday to protest against the regime’s incompetence and neglect in responding to their most basic demands. 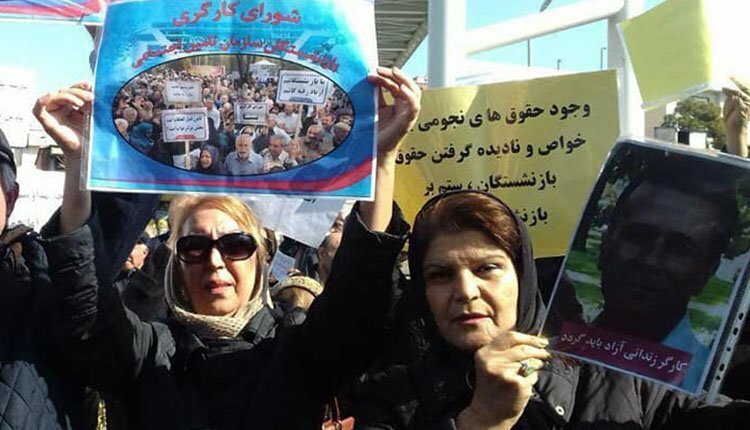 In protest to the clerical regime’s corrupt policies, retirees in Tehran held a protest in front of the parliament on Sunday morning, February 24, 2019. The protesters then marched to the Planning and Budget Organization. A large group of female educators participated in the retirees’ protest gathering in Tehran. The main demands of the protesting retirees in Tehran are higher pensions and better health insurance benefits. They accused the government and parliament of betraying the retirees and the workers and chanted slogans against Nobakht, the head of the Planning and Budget Organization, calling for his dismissal. The state-run ILNA news agency reported that the retirees in Tehran, despite repeated protests, have still not received any response to their demands. On the same day in Isfahan, retired employees of medical universities, retired steel factory workers and retired teachers gathered outside the Isfahan governorates office demanding their delayed paychecks. The earthquake-stricken people of Sarpol-e Zahab also gathered on Sunday afternoon in front of the city’s governorate to protest the power outage of Camp Nashat Park and called for electricity to be reconnected. In an attempt to prepare the city for exploiting the media coverage of Rouhani’s visit to Sarpol-e Zahab, government agents have cut off the electricity and water supply of Conex shelters in the city in order to force the earthquake-stricken people to leave the Conex shelters. The authorities want to prevent the genuine coverage of this earthquake-stricken city in the media and pretend that all the people of Sarpol-e Zahab have been settled in their promised homes. In another event, a group of teachers from Qaleh Ganj city, Kerman province, also gathered in front of the office of the city’s Friday Prayer and launched a protest rally on Monday, February 25, 2019, in protest against the authorities’ failure to meet their demands. Moreover, the defrauded depositors of various financial credit institutions held protest gatherings in Tehran, Mashhad, and Karaj. On Monday, February 25, 2019, the defrauded depositors of the Caspian Credit Institute in Tehran protested in front of the Prosecutor’s Office. On the same day in Mashhad, the defrauded clients of Badr Tous and Payvand, subsidiaries of the Caspian Credit Institute, gathered in protest outside the Governorate building. As a symbolic gesture, they spread out an empty table on the ground and sat around it, signifying their poverty. The defrauded clients of the Pars Aqua Village in Karaj also launched a protest on Sunday, February 24, 2019, in protest to losing their properties.